Adopting a dog from a rescue centre or animal welfare organisation can be a very rewarding experience. Many rescue dogs make wonderful loving pets who become loyal companions. Introducing a rescue dog to his new family is part of the process of settling him into his new home. Before introducing the dog, however, there are a few key points to consider. When bringing a new rescue dog home and introducing him to his new environment, it is useful to give him his own 'safe place' where he can go and feel secure. A dog basket, crate or a certain area of the house are all perfect places for a dog to feel safe in. This is also somewhere where he can sleep. Giving a dog his own safe area helps him to quickly integrate into the household. Before introducing a dog to the family it is important to teach young children how to treat dogs. 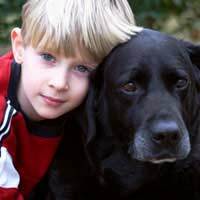 Children should be taught to be gentle with any animal, but particularly a rescue dog. They should also be taught never to surprise or frighten a dog. Even though the rescue centre will have provided any background information that they have about a dog and his suitability for being housed with children, a rescue dog should not be left unsupervised with children until everyone is confident of his behaviour. A rescue dog may well be confused when he comes to his new home. He is likely to have faced several upheavals in his recent past. While a rescue dog will have been used to the company of other animals and will be used to people visiting him with food and for exercise, he may well be unsure about meeting a lot of people at once. Therefore a rescue dog should be introduced slowly to the adult members of his new household and not overloaded with attention to start with. Too many people at one time may be too loud for a dog who has not been used to this and this may result in him becoming frightened or nervous. A dog will soon let it be known when he is ready for more attention. Dogs love routines and one of the best ways to train a dog is to get him into a daily schedule. This is important when introducing a rescue dog to his new home. Many people find that starting as they mean to go on helps to set the ground rules for the dog early on and get him used to his new family and environment. This will involve setting times for feeding and exercise. Both of these occasions are good opportunities for the dog to get to know and bond with his new owners. A rescue dog often needs a little extra reassurance. This helps him to understand that he is a permanent feature in his new home and an important part of the family. Introducing him into his new home will help to reassure him that he is a much loved pet.